This pdf clocks in at 24 pages, 1 page front cover, 1 page editorial, 2 pages of explanation of how to use this, 1 page ToC, 2 pages of SRD, 2 pages of advertisement, 1 page back cover, leaving us with 14 pages of content, though it should be noted that, as always with Legendary Games, we get a lot of content per page. First of all: No, your class does not have the lame “Robot Summoner”-name – that is only for the purpose of, you know, making sure you know what you get. The class is called “Steel Soul”, which sounds damn metal to me. The steel soul is a variant of the unchained summoner and sports ¾ BAB-progresion, good Will-saves d8 HD, 2 + Int skills per level and proficiency with simple weapons and light armor. The steel soul does not suffer from arcane spell failure chance when casting spells in light armor. Spellcasting is spontaneous and governed by Charisma, with 5th level and every 3 levels thereafter providing the option to lose a spell in favor of a new one. Spellcasting goes up to 6th level and sports its own spell list: The list is detailed, with more uncommon spells hyperlinked. The list makes use of UM, UC, ACG, and, of course, the Technology Guide. A key feature that is available to the class from the get-go would be the nanite link, which allows for the robot to apply the steel soul’s Charisma modifier to the save DC of the robot’s abilities. As a standard action (extraordinary, fyi) that does not provoke AoOs, the steel soul may use nanite surge, healing a robot touched by 1d6 points of damage, which increases by +1d6 at 3rd level and every odd level thereafter. The robot summoner may use this ability 3 + Charisma modifier times per day. Of course, the class does get a robot companion. The robot gains ¾ BAB-progression, 1/4th save-progression and begins play with 2 skills, which increases to up to 30 at 20th level. Robots with high Intelligence modify this accordingly. They per se have no class skills, unless an upgrade explicitly grants them – more on that later. They begin play with one feat and increase that to up to 8. 2nd level yields a Str/Dex-bonus of +1, which increases to up to +8 at 20th level. A first level robot has a maximum number of 3 attacks, which increases to a maximum of 7 at 19th level. At 2nd level, the robot gains +2 to AC, half that amount (+1) to hardness, which scales up to +16/+8, respectively. Robots may not wear armor, so this is a pretty crucial defense component. Robots begin play with low-light vision and darkvision 60 ft. as well as share spells. As robots, they are immune to ability drain and damage, bleed, death effects, disease, energy drain, exhaustion, fatigue, mind-affecting effects, necromancy effects, nonlethal damage, paralysis, poison, sleep effects and stun. An important balancing tool between robot and steel soul would be that they share magic item slots: If the robot wears a ring, the steel soul may not wear more than one ring, for example. This alone would not suffice to make the robot okay, though: The list of immunities is pretty massive, after all. The Achilles’ heel of the robot would be critical hits: Whenever the robot takes damage from a crit, it must succeed a DC 15 Fort-save (remember: Sucky, sucky saves…) or be stunned for a round; on a success, the robot is still staggered. The robot retains immunity against other sources of the stun condition (nice catch!). Additionally, robots are vulnerable to electricity damage. 2nd level yields evasion and 15th level improved evasion. At 9th level, we either get Multiattack, or, if the robot does not have 3+ natural attacks, a second attack with one natural weapon at -5 to BAB; basically, an iterative attack. Also at 9th level, the robot gains integrated weapon, allowing the robot to treat a technological weapon as a natural weapon, which includes proficiency as well as the option to fire in melee sans incurring AoOs. Robots may be quadruped, biped or serpentine regarding their base forms, with upgrades, stats and movement rates etc. between them being rather well-balanced. The evolution-equivalent would be upgrades. These may be changed whenever the steel soul gains a new level, and the robot begins with one upgrade point, increasing that up to 15 at 20th level for a ¾ progression analogue to BAB. Weapon upgrades may not be disarmed and a few are base form exclusives or have minimum levels as prerequisites. There are upgrades with a point-value ranging from 1 to 4, presented by point value first and within each category, alphabetically. Among the 1-point upgrades, we can find, for example, advanced programming for a skill for +8 to it; similarly, weapon proficiency can be found, with climb speed, bite, reach, increased damage die for a natural attack, etc. We can also get a tail (and a tail slap), a tentacle or pincers or a dart gun that can deliver poison or acid. Push and pull can also be found and e.g. minor save boosts or increased natural armor may be found as well as an AC-upgrade versus beams and rays. Oh, and yes, the robot, if large enough, can become a mount! The 2-point upgrades include increased ability scores (with a level cap for multiple uses to prevent abuse) as well as increased skill points or proficiencies. Temporary flight via booster jets, adding electricity damage to attacks or gaining a chainsaw or a laser torch can be found here. Grab and constrict as well as poison and pounce or trample can be found here. Additionally, additional arms can be found and a net-gun is offered as well. There also are wheels, which tie in with the number of legs the robot has. Among the 3-point upgrades, we can find blindsense, energy immunity or the ability to see invisible creatures. Integrated pistols can include arc pistol, laser pistol, sonic pistol and zero pistol. There also is a slow self-healing option here and the upgrade for a charged weapon that can end up stunning targets on crits. The 4-point upgrades include blindsight, chameleon circuitry (Hide in plain sight variant), upgrade to Large size (or Huge for +6 points, yes, with minimum level requirements, obviously), fast healing (with a proper minimum level) and several rifles can be found: Arc, laser, sonic and zero rifles may be equipped. Finally, the robot can have a force field of temporary hit points – while in effect, this also protects against critical hits. These robots may be summoned by the respective steel soul in 1 minute from a 1-way underground vault and dismissing it is a standard action. I like this tech-y notion of an underground robot factory with gating etc. rather well – the 2nd level summon robot spell presented here also employs this. 2nd level yields Craft Construct for the steel soul, but until 5th level, he may only use this to repair his robot as per the rules to build and modify constructs. At 5th level, constructs created cost half as much, but the steel soul may only create mostly metal constructs, and the constructs thus created are robots, but they lack a proper long-term power-source, only lasting for 1 level per class level, with recharges costing ½ the cost to craft. Nice way to allow for multiple robots without breaking the game. Starting at 4th level, the steel soul gains +2 to AC and saves (bonus types correct – kudos!) while in reach of the robot, but only while the robot is not grappled, etc. 12th level doubles this bonus and makes the benefits also apply to allies. At 18th level, these bonuses further increase by +2 and the robot may also share the benefits of a variety of different, defensive upgrades. At 6th level, the steel soul can dimension door the robot to his side 1/day, +1/day for every 4 levels thereafter. At 8th level, the steel soul may use two uses of the nanite healing ability to use it at close range instead. 10th level allows for the expenditure of 2 charges to temporarily grant the robot fast healing 2 for 1 minute, which increases by +1 at 12th level, 4 at 16th and 5 at 20th level. This may explicitly e used in conjunction with the robot’s fast healing. At 16th level, the nanite healing ability may be activated as a swift action instead. The capstone is instant restoration, which lets the steel soul 1/day use all nanite healing charges as an immediate action (min 1 required) to instantly restore the robot to full functionality and hit points. The class does not come with any favored class options, supplemental feats or archetypes. Editing and formatting are as tight and good as we’ve come to expect from Legendary Games – the class works smoothly as presented. Layout adheres to the nice two-column full-color standard of the Iron Gods-plug-ins. The pdf comes with a second, more printer-friendly version. Artworks are full color and nice, though fans of Legendary Games will be familiar with most of them. The pdf comes fully bookmarked for your convenience. Jeff Lee’s steel soul class is a really good take on the trope of the robot summoner. The modified spell list and eidolon chassis make this variant class feel surprisingly distinct and are executed well. The class is 100% functional for the table and should provide no issues. While 14th level at first glance looks like a dead level, we get +1 maximum number of attacks and an upgrade for the robot, so I’m fine with the steel soul only getting new slots. Craftsmanship-wise, I have nothing to complain about regarding what’s here. I do have a bit of an issue with what’s not here, though: The lack of favored class options, archetypes, sample NPC or supplemental feats is a bit sad to see. I also couldn’t shake the feeling that, engine-wise, this fellow could have carried more. As written, the steel soul is pretty much the healing battery for the robot, which, while not bad, undersells the concept a bit. The nanite angle could have yielded something really cool: You know, short-term boosts for the robot that upgrade the upgrades granted. Bursts of plasma; pummeling fields…the flashy stuff. An engine based on such interaction would have felt a tad bit more unique than this fellow. So yeah, as a whole, I enjoyed the steel soul. It is a distinct class that feels like a variant, but also has its unique identity. While it undersells its premise a bit, as a whole, I consider this to be worth checking out, though it does fall a bit short of the greatness it could have been. My final verdict will be 4 stars. 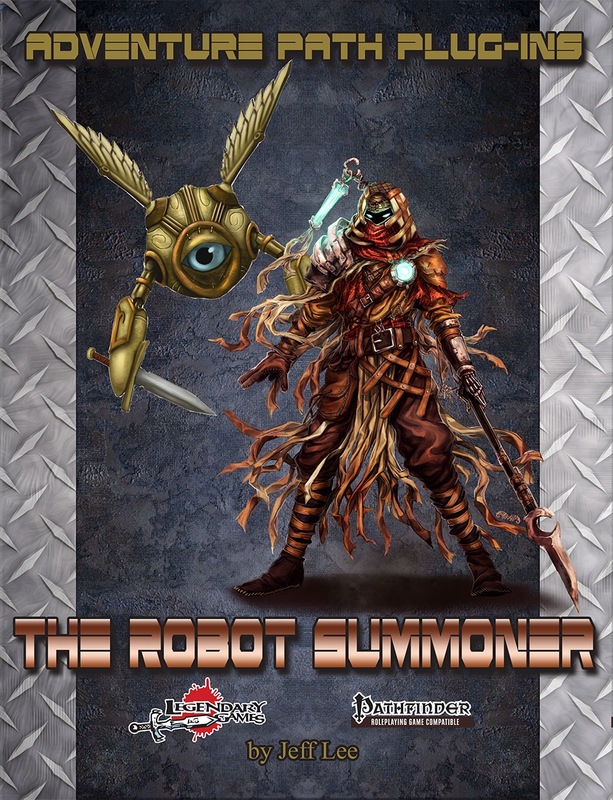 The Robot Summoner is here! ... So now we have two technology summoner variants: the AI-themed Technopath from Fat Goblin Games and the robot-themed Robot Summoner from Legendary Games. Did both companies take a look at my Nanotech Summoner android racial archetype (posted back in October 2014) and decide "Hey this is awesome let's make it better!"? Not complaining, just trying to prop myself up. And Nate, I totally agree. As soon as I get done work I'll be purchasing and perusing this product. So this definitely caught my attention. But while I know the concept is awesome, what's the execution like? I think you'll find it to be excellent; I like what Jeff Lee has done with the class. However, I definitely look forward to someone posting a review! So just a quick thing, is there perhaps a printer-friendly version of this that could be made. Because even reading the PDF on a computer is painful because of the lack of contrast between text and background. The background is really busy as well, which really gets in the way of reading. There's not one at the moment, but I can check in with layout and see if one could be made. I didn't even know you existed until I looked at this product. What I can tell you from my end is that LG wanted supplementary material for the Legendary Planet adventure path. I was contacted and asked if I could do a summoner variant that had a robot instead of an eidolon. I said "Cool. Yes I can." And I did. Yeah, this was originally going to be the backmatter article for the adventure Dead Vault Descent, but I ended up getting TOO MUCH GOOD STUFF to use, and this class was the best match size-wise for turning into a standalone product, so a standalone product it became! I like the class. It's different enough from the Technopath and Robomancer in a way that all three could be viable options for a game. My only gripe is the lack of a full flight option for the robot. Booster rockets are cool for 2-points, but what about full flight for 4 (like the unchained eidolon has). A flying robot akin to a quadrotor or even a hovering drone (like Weebo from Flubber) would be great robots for this class.